There is a whole industry to support trucking that offers opportunities for women as well…each of these areas include engineering and technology solutions, and they benefit from including strong women with STEM education and training. To kick off National Truck Driver Appreciation Week, Mediaplanet announces the launch of this September’s edition of “Empowering Our Female Truck Drivers.” This campaign will advocate for professional female truck drivers, their hard work and commitment to tackling one of America’s most important and demanding jobs. According to the American Trucking Association, the trucking industry generated $676.2 billion in revenue in 2017 and carries 70% of all freight tonnage. While there are over 3.5 million truck drivers in the United States today, the industry needs to hire about 900,000 more drivers to meet rising demands. Only about 6% of the truck driver population is female. 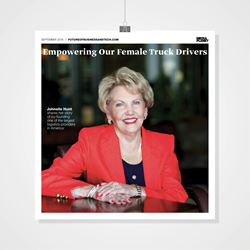 The print component of “Empowering Our Female Truck Drivers” is distributed within today’s edition of USA Today in Houston, Dallas, Nashville, San Francisco, Cincinnati, Chicago, St. Louis and Kansas City markets, with a circulation of approximately 250,000 copies and an estimated readership of 750,000. The digital component is distributed nationally, through a vast social media strategy, and across a network of top news sites and partner outlets. To explore the digital version of the campaign, click here. NASCAR driver Julia Landauer also lends her voice to the campaign. As an advocate for women in STEM, the campaign sheds a light on the idea that young women are more likely to pursue these careers when they are more likely to see other females in male-dominated fields being appreciated for their hard work and being given more opportunities to diversify the workforce. This campaign was made possible with the support of the Women in Trucking Association, Mack Trucks, Daimler Trucks, TravelCenters of America, Phillips 66, Giti Tire, Axalta Coating Systems, Shell Rotella, The NATSO, Averitt Express, J.B. Hunt, Vehicle Tracking Solutions, The American Transportation Research Institute, Fleet Complete, and the National Institute for Occupational Safety and Health. Phillips 66 is a diversified energy manufacturing and logistics company. With a portfolio of Midstream, Chemicals, Refining, and Marketing and Specialties businesses, the company processes, transports, stores and markets fuels and products globally. As one of the largest finished lubricants suppliers in the U.S., Phillips 66 Lubricants is known for manufacturing and marketing high-quality base oils and sophisticated formulations in three lubricant brands: Phillips 66®, Kendall® Motor Oil and Red Line® Synthetic Oil. These premier products reach across every key market sector, including automotive, trucking, agriculture, aviation, power generation, mining and construction. For more information, visit http://www.Phillips66Lubricants.com and like us on Facebook.